Customized manufacturing solutions: As a full-liner for the additive manufacturing of metal parts DMG MORI combines its LASERTEC 3D and LASERTEC SLM models with conventional CNC machines. Unique: Four process chains with ADDITIVE MANUFACTURING and machining from a single source. As a global full-liner with over 20 years of experience in the ADDITIVE MANUFACTURING of metal parts, DMG MORI represents innovative manufacturing technologies and a worldwide service. The portfolio includes four complete process chains for additive processes using powder nozzle or powder bed technologies. 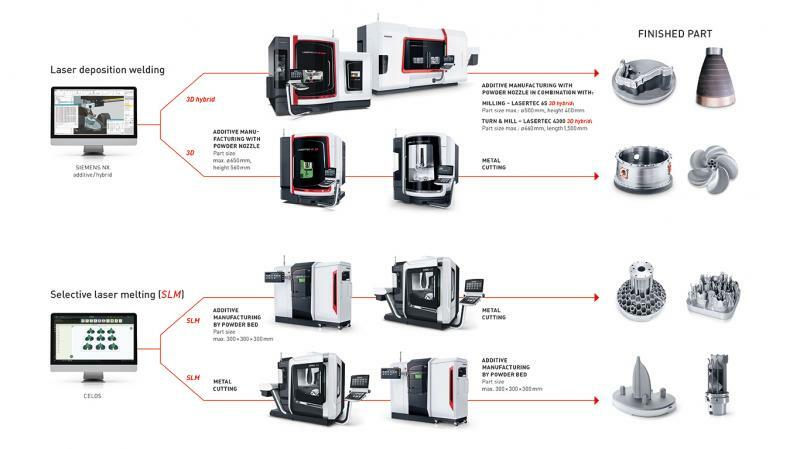 The offer that includes the LASERTEC 3D hybrid, LASERTEC 3D and LASERTEC SLM series has been expanded recently by DMG MORI to include the high-precision LASERTEC 12 SLM. The innovative OPTOMET software rounds off the offer with intelligent parameter control. 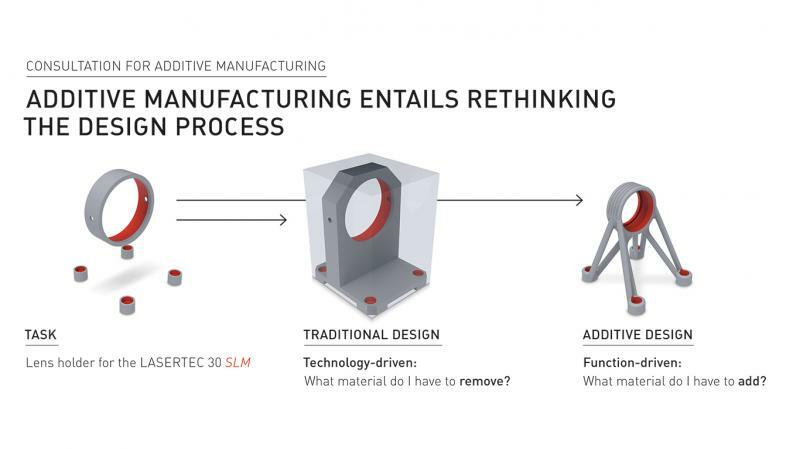 The steady growth of additive manufacturing technologies is alerting designers to the potential of this method in the construction of components and tools. The quality of workpieces produced with additive methods is also increasing as is machining speed. This has resulted in consistently positive forecasts: ADDITIVE MANUFACTURING expected to increase in a high double-digit range. 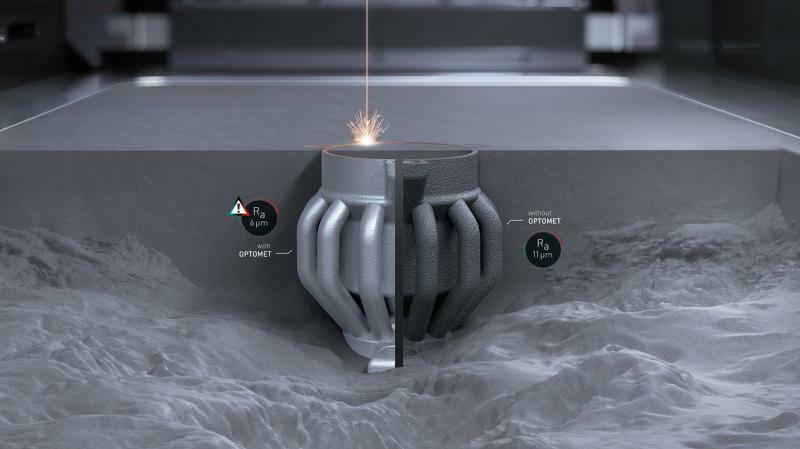 “In particular as a complement to conventional production methods powder nozzle and powder bed processes offer expedient and extremely promising possibilities”, explains Patrick Diederich, responsible for ADDITIVE MANUFACTURING at DMG MORI. DMG MORI has performed successfully on the market for over five years now with the combination of laser deposition welding and metal-cutting machining on the machines of the 3D hybrid series. 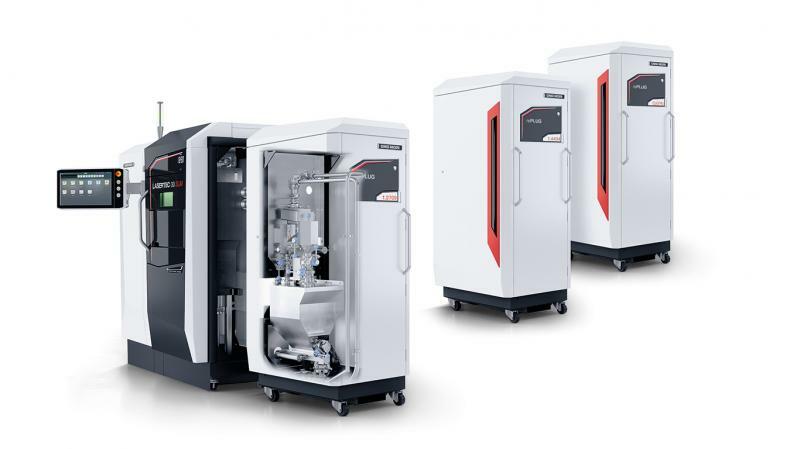 As the most widely used exponent in this series, the LASERTEC 65 3D hybrid is ideally suited for the additive manufacture of complex prototypes and small series parts, for the repair and coating of components. Next comes the LASERTEC 65 3D, which is geared solely towards laser deposition welding as a complement to existing machining centers on the shop floor. The LASERTEC SLM series expands the portfolio to include the powder bed method using selective laser melting. Thanks to the combination of additive manufacturing technologies with conventional CNC machines DMG MORI has realized four individual needs-based process chains. DMG MORI offers the LASERTEC SLM series for additive manufacturing in the powder bed (Selective Laser Melting). The LASERTEC 30 SLM 2nd Generation has a 300 × 300 × 300 mm build volume and with its Stealth design offers optimum user comfort, while the new LASERTEC 12 SLM excels with its high above-average accuracy. With a focal diameter of just 35 µm it is four-times more accurate than the current industrial standard. This allows a significantly finer resolution of the structures thus enabling far thinner wall thicknesses. Standing at 125 x 125 x 200 mm the build volume of the powder bed machine is unique for this precision class. The user-friendly Stealth design and rePLUG powder module, of LASERTEC 30 SLM 2nd Generation fame, for a material change in less than two hours guarantee a high level of both process autonomy and industrial safety. Two process chains can be realized with powder bed technology: On the one hand, workpieces produced by means of additive manufacturing can be finished to the required surface quality on a milling machine such as the 5-axis DMU 50 3rd Generation. On the other, the LASERTEC SLM machines can finish previously milled base plates and bodies without any need for support structures. The integral software solution for CAM programming and machine control CELOS rounds off the process chains with the LASERTEC SLM series. The coordinated and uniform user interface enables parts to be programmed externally with minimum time expenditure and transferred to the machine. Thanks to the efficient flow of information and intuitive operation CELOS ensures optimum processes in the pre- and post-processing of additively manufactured parts. In addition the open system of the LASERTEC SLM series enables individual adjustment of all machine settings and process parameters, right through to include an unlimited choice of material manufacturers. With a share of 30 percent in the Indian software developer INTECH DMG MORI has gained access to the key software and technological expertise for generative production. As a pioneer in the field of 3D print in India, the company has specialized in ADDITIVE MANUFACTURING and the related software solutions – including the artificial intelligence in this field. A first result of this collaboration is the new OPTOMET software, which INTECH offers for the LASERTEC SLM series from DMG MORI. It has self-adjusting and learning algorithms that calculate the required parameters of the SLM process in advance within minutes. This means layer thicknesses, for example, can be calculated freely, which in turn enables a faster and therefore also more productive build. OPTOMET also has a material database that allows users to use material from all manufacturers without having to test them in advance. The open system also allows independent expansion of the database using the customer’s own experiments. OPTOMET is also able to adjust parameters in such a way that material properties, such as hardness, porosity and elasticity, can be changed or optimized. Additive manufacturing is the perfect complement to conventional machining and opens up completely new freedoms in design. The potential of this technology is already recognized in many companies, but often they do not have the necessary knowledge. With its new consulting approach the DMG MORI Academy pursues the goal of supporting companies in building up the necessary knowhow and establishing the process chains linked with the LASERTEC 3D and LASERTEC SLM series. The consultancy portfolio encompasses services along the entire process chain of additive manufacturing, including the AM Quick Check as the perfect introduction to exploiting this potential. The DMQP program, that has been tried and tested for many years in conventional machining, is now also being used in additive manufacturing. The certified machine peripherals and technology accessory components have now been expanded to include the fifth DMQP category “Materials”. This opens up new diversity in the choice of powder suppliers and ensures consistent powder qualities with the desired material properties.